On June 23, 1985, 329 innocent people, most of them Canadians, lost their lives in the worst-ever terrorist attack in Canadian history. In order to provide the families of the victims with long-overdue answers, and to help prevent another such tragedy, in May 2006 this Government called the Commission of Inquiry into the Investigation of the Bombing of Air India Flight 182. Our Government gave the Commission a mandate to examine the events surrounding the bombing and the subsequent investigation, and to identify gaps in Canada's security and intelligence system. 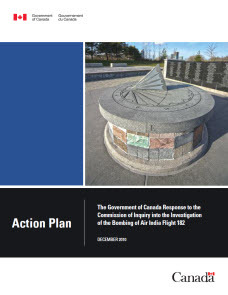 The Commission's final Report, Air India Flight 182: A Canadian Tragedy, is a damning indictment of actions taken before and after the tragedy. On June 23, 2010, at the 25th anniversary commemorative ceremony for the victims of the tragedy, the Prime Minister of Canada apologized on behalf of the Government of Canada and all Canadians for the institutional failings of 25 years ago and the treatment of the victims' families thereafter. The most important question now is whether we are prepared to address similar threats today. The Commission's Report underscores the fact that we must never grow complacent since terrorist threats in Canada are real, persistent and evolving. The Commission's Report is an important opportunity to learn from the past to better secure our future. This Action Plan outlines how the Government will address outstanding security challenges raised by the Commission. The commitments made here build on important changes that have been made since 1985 to counter terrorism in Canada. They will be implemented in a way that addresses the most critical gaps as a priority, given the need across government to prioritize investments. In order to ensure that the public is kept apprised of the implementation of the commitments in this Action Plan, the Government will be providing regular updates on progress made. We again thank Commissioner John Major and his team for their work. It is not too late to learn from the tragedy that was Air India. It is our sincere hope that the commitments we are outlining may bring a measure of comfort to those who still grieve for the loss of their loved ones. "...the finest memorial we can build to your loved ones is to prevent another Flight 182. This is our duty to you, and to all Canadians." The bombing of Air India Flight 182 on June 23, 1985, represents the worst terrorist attack in Canadian history. The attack – planned and executed in Canada – claimed the lives of 329 innocent people – 280 of them Canadian. In the immediate aftermath of the bombing, and in the years that followed, the largest, most complex and expensive investigation in Canadian history failed to bring those responsible for the bombing to justice. Subsequent reviews also failed to provide answers to the families of the victims on how this tragedy could have been prevented. On June 16, 2010, nearly 25 years to the day after the bombing, the Government received the final Report of the Commission of Inquiry into the Investigation of the Bombing of Air India Flight 182. Commissioner John Major spent four years examining the details of the bombing and its investigation, and delivered to Government a comprehensive and in-depth assessment of the challenges facing security and intelligence agencies in Canada before, during, and immediately after the bombing. The Commission identified numerous mistakes that were committed around the time of the bombing, including as regards the treatment of the victims' families. It is imperative that the Government recognize these shortcomings and work consistently to prevent another such tragedy. Since 1985, and especially following September 11, 2001, Canada's security and intelligence system has evolved significantly: operational policies have been reformed, training has been updated, new laws have been enacted, and the machinery of government has been restructured for greater effectiveness. Recent convictions in cases like the "Toronto 18" demonstrate that Canada's security intelligence and law enforcement agencies have become increasingly effective not only in preventing acts of terrorism, but also in bringing those responsible to justice. However, as highlighted in the Commission's Report, some challenges still exist. The Commission's Report provided an assessment of what gaps remain in Canada's security and intelligence system, and made recommendations for how these gaps should be addressed. Although the Government cannot eliminate entirely the possibility of another terrorist attack, it is committed to learning from the past to ensure a safer, more secure future. The Commission's findings and recommendations are an important contribution to this endeavour. make targeted investments and improvements in aviation security over the short, medium and longer term, always focusing on areas of highest risk. providing a more robust external review mechanism for the Royal Canadian Mounted Police (RCMP). The Commission closely examined how the Air India-related prosecutions were handled, and the processes that currently exist to manage similarly complex trials. "Mega-trials" – which are usually the result of long and complicated criminal investigations – pose significant challenges for the criminal justice system. For example, huge volumes of evidence need to be managed in a timely fashion, a task which is further complicated when the evidence involves sensitive information. Also, these trials frequently rely on expert and wiretap evidence for which there are complex court processes. Finally, these trials are generally accompanied by numerous preliminary motions. Because of how long they take, mega-trials may infringe on an accused's right to be tried within a reasonable time and therefore run a significant risk of collapsing under their own weight. These challenges, and the risks they engender, have been recognized by all elements of the criminal justice system. In addition to Commissioner Major, lawyers, judges, governments, academics and other experts across the country have been looking at this issue for some time, and from their reports, it is clear that there is a consensus that reform is needed. will continue to identify best practices to improve the conduct of mega-trials. The Public Prosecution Service of Canada will ensure that they are reflected in its practice directives to its prosecutors. The protection of witnesses and sources in terrorism cases is critical in successfully prosecuting those responsible for committing terrorist acts. When protection is effective, other potential witnesses are more likely to come forward to intelligence and law enforcement agencies with information. The Air India investigation showed Canadians that witnesses and sources do indeed face risks. In its Report, the Commission stated that there are unique challenges when handling witnesses in terrorism cases – challenges such as possible intimidation within their communities. Specifically, the Commission was concerned about the treatment that witnesses received during the Air India investigation and emphasized the need to take cultural sensitivities into account. The federal Witness Protection Program is an important tool in the Canadian criminal justice system. At the time of the Air India investigation, there was no formal federal program. However, the current Program, which was legislated in 1996, has evolved significantly since its introduction such that it is now considered to be one of the most effective witness protection programs in the world. The Program's policies and practices are regularly reviewed and improved, including to ensure that they effectively meet the evolving needs of witnesses. enhance the way sources of mutual interest to the Canadian Security Intelligence Service (CSIS) and the RCMP are handled. Although the Commission did not provide any specific recommendations with respect to terrorist financing, it provided substantial insight into this key area of combating terrorism. Depriving terrorists of access to funds is a fundamental tool in undermining terrorist activities. Terrorist financing may involve funds raised from legitimate sources, such as personal donations, profits from businesses, or charitable organizations, as well as from criminal sources, such as the drug trade, the smuggling of weapons and other goods, fraud, kidnapping and extortion. Canada has a strong and effective anti-terrorist financing regime. Canada's laws impose requirements on financial institutions and other entities to help detect, deter and prevent terrorist financing. The Financial Transactions and Reports Analysis Centre of Canada (FINTRAC) collects, analyzes and shares financial intelligence. In addition, charities are regulated to address, among other things, the risk of their being used for the purposes of terrorist financing. Internationally, Canada is an active contributor to global efforts, for example within the Financial Action Task Force – the body that sets international standards for countering terrorist financing. establish a new forum to identify illicit financing threats from abroad and to develop targeted measures to safeguard Canada's financial and national security interests. The Commission focused at length on the importance of coordination and information sharing among the departments and agencies charged with ensuring the safety and security of Canadians. There are no fewer than a dozen Government of Canada entities collecting or analyzing information related to terrorist threats. While each has a unique and important mandate, they must also together ensure comprehensive security coverage by working as seamlessly as possible. Serious challenges – even tragedy – can arise when, for example, organizations have different ways of classifying the same threat, or when they lack the necessary mechanisms to cooperate on sensitive matters. Appropriate information sharing can also be inhibited by the complexity and number of laws and policies that govern the use of personal information by government. Over the past three decades, cooperation in the Canadian security and intelligence community has improved significantly. In particular, the relationship between CSIS and the RCMP has matured and both agencies have a clearer understanding of their roles and are able to work effectively together – which was a serious challenge in 1985. The relationship has been further solidified by numerous operational and legal initiatives. For example, a Joint Management Team between the two agencies ensures that strategic direction and protocols are in place to meet the current and emergent threat environment. These teams also work to ensure that where CSIS and the RCMP are investigating similar cases, their activities do not conflict with each other. CSIS and the RCMP have also developed Joint Operational Workshops to allow employees of each organization to share ideas, learn about each other's mandates, and find ways of working in a more cooperative and effective manner. Integrated National Security Enforcement Teams (INSETs) have been introduced to bring investigators from different agencies together to facilitate and coordinate national security criminal investigations. INSETs now operate in four major Canadian cities (Montreal, Ottawa, Toronto and Vancouver). Although these improvements have dramatically changed the nature of interdepartmental coordination, challenges still remain – challenges that are common to most democracies around the world. enable the review of national security activities involving multiple departments and agencies, and create an internal mechanism to ensure accountability and compliance with the laws and policies governing national security information sharing. CSIS and the RCMP cooperate very closely to ensure our national security. Their mandates, however, are distinct. This is a crucial aspect of the security and intelligence system in Canada (and in most other democracies as well) as it allows for information to be collected in different ways for different purposes: CSIS uses its tradecraft and sources to gather intelligence in order to provide advice to the Government on activities it suspects pose a threat to Canada. For its part, the RCMP collects evidence – information that can meet the standards required to prove a case in a criminal prosecution. The Commission examined the relationship between security intelligence and evidence at great length. Indeed, whether and how intelligence can be used as evidence is a complex issue and is becoming more acute. Since the coming into force of the Anti-terrorism Act, CSIS and the RCMP are increasingly involved in investigating the same activities, as activities related to terrorism can constitute both a threat to the security of Canada and a crime. As noted in the previous section, as a result of extensive efforts made by both organizations over the past three decades to introduce numerous operational and legal initiatives, their interdepartmental coordination and cooperation has improved significantly and they are able to work effectively together. Because of this cooperation, there is a risk that intelligence may be subject to the Crown's constitutional disclosure obligation to the accused (subject to appropriate privileges) – whether or not it intends to introduce that material into evidence, and regardless of whether the material pertains to the person's guilt or innocence. Indeed, the number of cases where there is pressure to disclose intelligence information in criminal proceedings is increasing. This can result in competing public interests: the disclosure of intelligence may inhibit ongoing intelligence investigations that are critical to national security, yet there is much to be gained from the arrest and conviction of terrorists – gains that cannot be made without appropriate disclosure. It should also be noted that the very process by which privileges or exceptions are applied to disclosure – such as the application of national security exceptions pursuant to the Canada Evidence Act – is also part of the challenge of addressing the issue of intelligence in criminal prosecutions. The procedure whereby a judge reviews and balances the competing public interests in disclosing or not disclosing relevant intelligence information can be time consuming and subject to change if new evidence is presented during the trial. The current procedure relies on the Federal Court to appropriately protect sensitive information. consider the Supreme Court of Canada's upcoming decision on the current process of disclosure that involves the Federal Court. A significant portion of the Commission's Report was devoted to examining issues related to aviation security. As the host country of the International Civil Aviation Organization (ICAO), Canada has a history of meeting or exceeding international aviation security requirements. In the face of tragedies in the aviation industry, Canada has acted promptly and with determination to make improvements, in some cases acting before ICAO standards have been developed. Even since the adjournment of the Commission's hearings in 2007, significant changes have been made to Canada's aviation security system. For example, the Canadian Air Transport Security Authority has been enhanced through investments in operations and new technologies, and through the testing of new aviation security measures such as vehicle screening at airports. In addition, the Air Cargo Security Program was established to allow for rigorous screening of air cargo and to enhance the security of supply chains. Furthermore, the development of aviation security plans is underway to promote coordination and integration of security at Canada's airports. This would require airport operators and their partners to assess their current security readiness and implement the most effective and comprehensive mitigation strategies. There is no doubt that civil aviation is a priority target for terrorists. With the December 25, 2009 thwarted terrorist attack on Northwest Airlines Flight 253 en route to Detroit, we have seen how even unsuccessful attacks generate far-reaching impacts on the economy, the aviation industry and the travelling public. It was in recognition of this threat that the Government committed over $1.5 billion over five years in Budget 2010 to the Canadian Air Transport Security Authority and the Air Cargo Security Program to strengthen the security of our aviation system and air travellers. The Government will continue to review and assess risks in this rapidly evolving and unpredictable threat environment, since areas that do not present important risks today may evolve into areas of concern tomorrow as terrorists change their targets, methods and tactics. It is the Government's intent to continuously strengthen aviation security in a way that achieves both efficiency and security in air transportation, and to prioritize investments on the basis of risk. enhance the Passenger Protect Program, which prevents individuals who pose a threat to aviation security from boarding an aircraft. The commitments made in this Action Plan represent some important changes to Canada's security and intelligence system, and some may require significant investments at a time when across government, spending must be carefully prioritized. As part of its response to the Commission, the Government will provide public updates on the progress being made on the commitments in this Action Plan.